The blaze broke out close to the Omni Centre shortly before 5pm. There are no reports of any injuries. A LARGE-SCALE FIRE at a disused industrial unit near the Omni Shopping Centre in Santry, north Co Dublin, has been brought under control. The alarm was raised shortly before 5pm this evening after the blaze broke out at a 30,000 square foot building in the Santry Hall Industrial Estate. At its height, eight pumps from Dublin Fire Brigade were tackling the blaze, supported by two ‘ladder engines’ — which are dispatched to alerts at taller buildings as a matter of course — along with command and other vehicles. There was heavy traffic in the area for a time as visibility was impaired by thick black smoke. One Twitter user said the air smelled “like rubber burning”. A garda spokesperson confirmed that there had been no injuries as a result of the blaze. The industrial estate where it happened is just off the Swords Road, close to the centre of Santry and around 400 metres from the entrance to the Dublin Port Tunnel on the M1/Airport Road. 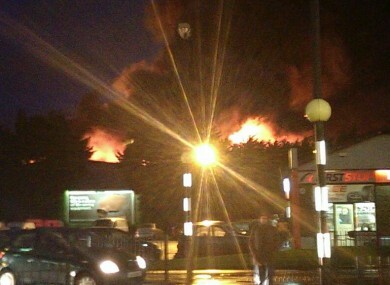 Email “Major blaze at Santry industrial estate brought under control”. Feedback on “Major blaze at Santry industrial estate brought under control”.